.."I’m not saying there won’t be a little pain so we might lose a little of it but we’re going to have a much stronger country when we’re finished, and that’s what I’m all about.".. Knock on effects of a SP500 sell off greater than -12% are: 1) Pensions risk. 2) The debt on share buy backs risk. 3) US Govt tax receipts via capital gains risk. 4) Allows a transfer of funds from stocks to bonds. 5) Will quantitative tightening turn into quantitative easing? Now for those over 40 years of age, (like the author), you know this market is just 'Nuts' and exponential upwards markets always (not some, but all) end the same way. Like the soldiers at Bastogne during WW2 the only way Mr Market can be rescued is by General 'Fed' Powell's QE4 (a maybe). 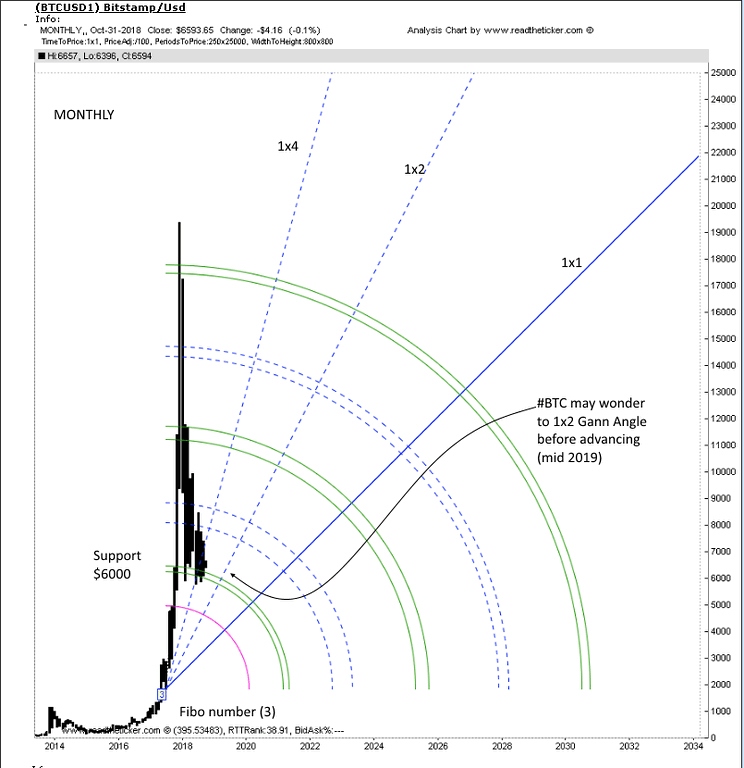 A reminder, remember Bitcoins exponential rally: $5000, $10,000, $15,000 on its way to $100,000. It too succumbed to market laws and a +50% correction followed. Folks this is normal. Individual stocks may retrace +50%, but do not worry the central planners will do all they can to slow down and limit leading indexes corrections. 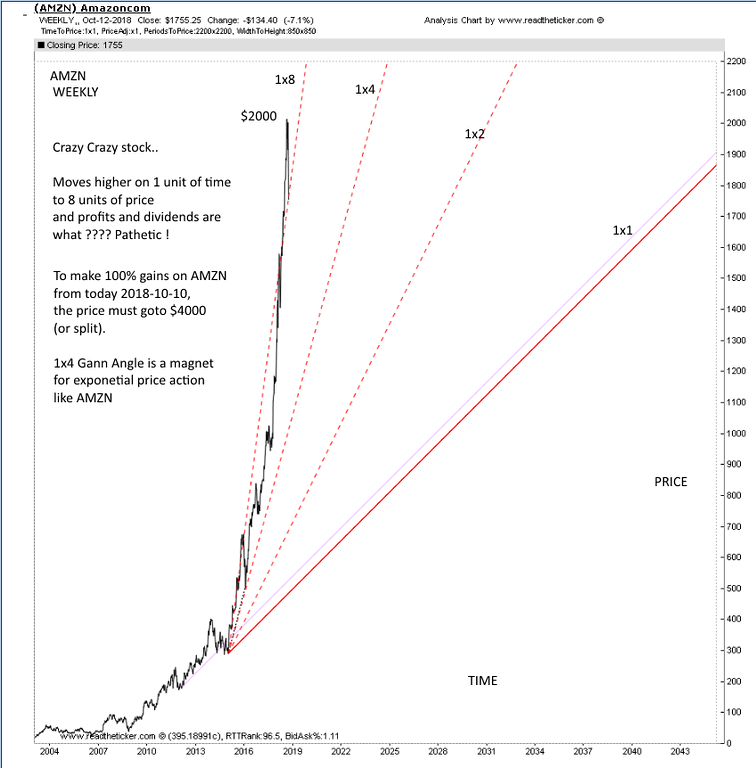 Below we have Apple, Amazon and Bitcoin with Gann Angles applied. 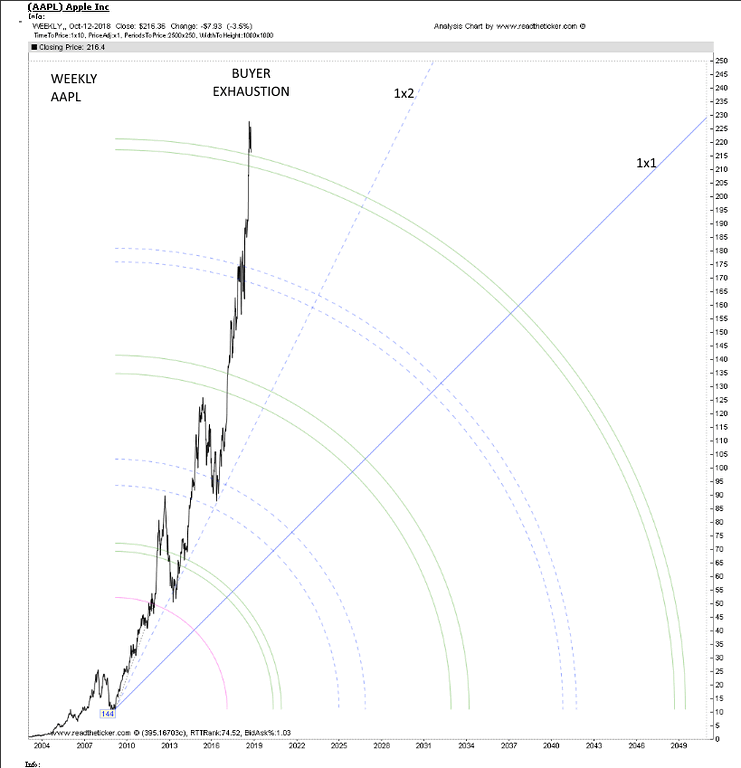 Gann angles show time and price performance: how many units of price and time represent trend action. Then you add Fibonacci arcs to measure future resistance levels, nice, know you have an excellent 'tell me no lies' indicator. A good market bet: Eventually Amazon and Apple will succumb to market laws and correct substantially. Is it today, who knows, we wait for more evidence to arrive on the chart to decide that! Disclaimer: The material is presented for educational purposes only and may contain errors or omissions and are subject to change without notice. Readtheticker.com (or 'RTT') members and or associates are NOT responsible for any actions you may take on any comments, advice,annotations or advertisement presented in this content. This material is not presented to be a recommendation to buy or sell any financial instrument (including but not limited to stocks, forex, options, bonds or futures, on any exchange in the world) or as 'investment advice'. Readtheticker.com members may have a position in any company or security mentioned herein.